This motorcycle is built from everything… With rims from a Camry, a p-trap from a sink, a diesel motor from a cement mixer, this hodgepodge motorcycle is one badass diesel custom. With all the different build combinations out there today, someone looking to build their very own motorcycle might find it difficult to be unique and create something that has never been seen before. However, this time, we check out and insane build from the hands of USPS Diesel technician, Sam Turner, From Atlanta, Georgia. Sam Turner has loved motorcycles ever since he received his first at age 8. Then at age 12 his Father taught him how to weld and he has been building things ever since. Sam’s creation allowed him to combine his knowledge as a diesel technician together with his fabrication skills and his passion for motorcycles into one build. What you see here is a hydrostatic twin turbo all-wheel-drive diesel motorcycle custom-built from the ground up. What it looks like is a cross between the Batpod in The Dark Knight and something out of Mad Max. Rolling down the road this bike must weigh the same as a small car and has the wheel base of a school bus. Rolling on mud tires and with a stretched wheel base the turning circle of this bike makes it less than practical, but who cares! The suspension is an air bag setup and is adjustable for ride height. Pulling up to his destinations the owner can just drop this thing to the ground and walk away, no kick stand necessary. 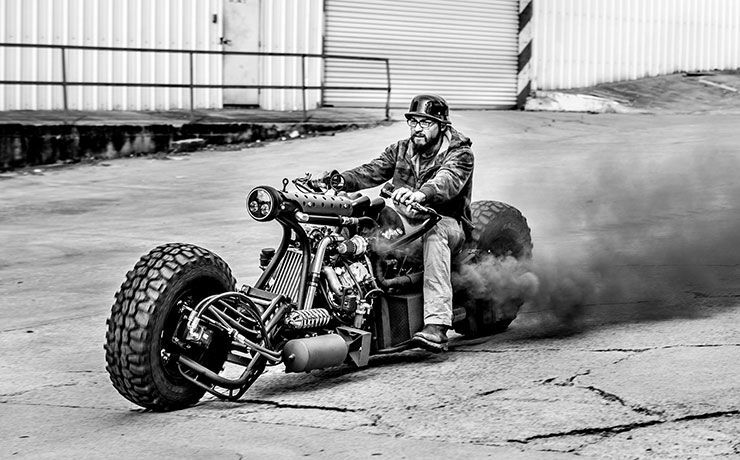 His custom bike has an 840cc 20hp direct injection V-twin diesel engine. Additionally, all this is complemented with 2 RHB31 turbochargers. 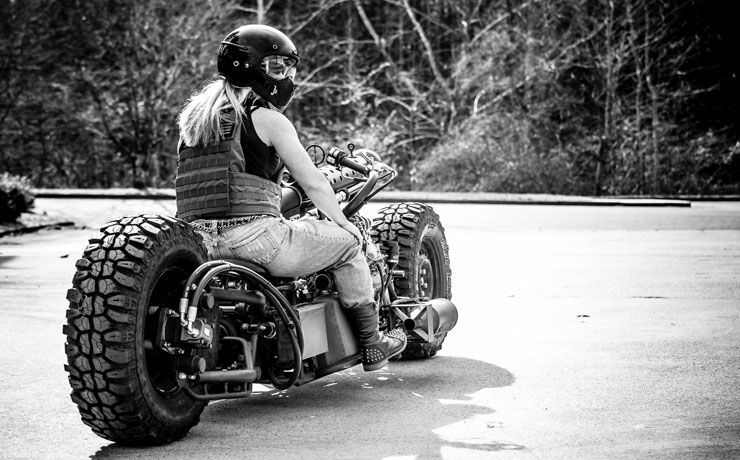 The bike measures at a staggering 11-feet and 3-inches, complete with two 2.5 gallon air tanks, a Jerrycans that serves as a fuel tank, an 5.56mm ammo box converted into a battery case, and a fabricated heat shield that resembles a gun heat shield. Check out the video below and see Turner’s mechanic monster. You can check testing ride on a public road here. 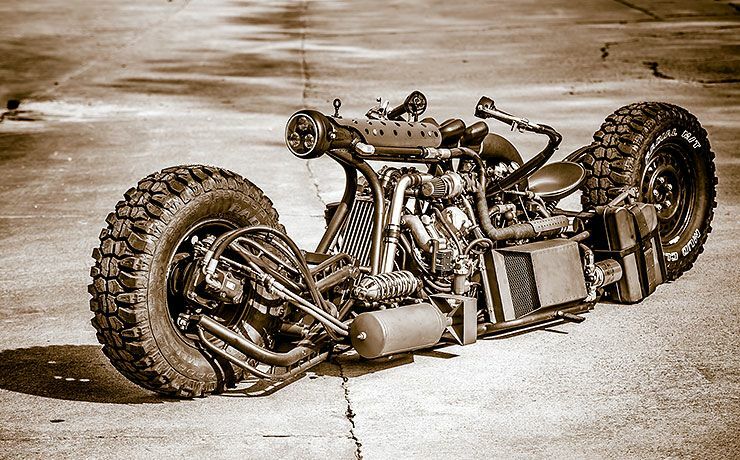 After that check out this steam powered “Black Pearl” motorcycle.